Overdue: August recap and 1-year Bloggoversary! By now, it’s so far along into September that I’ve kind of forgotten how August went. Fairly uneventful. I stayed mostly within the normal budget, and was able to put an extra $1,500 into the student loans. Nice! There were a couple “splurges” in August, namely I finally got an eye exam for the first time in 3 or 4 years and bought new contacts, and we also got a camping tent for our annual Labor Day weekend with Mr. Bacon’s race car friends. Overall, everything was very reasonable, which was reflected by being able to toss in the $1,500–what I’m now striving to pay extra each month. So the new balance as of September 1st was $76,985.70. That’s a decrease of $1,821.63 from the previous month (payments of $2,057.14 with $235.51 in interest). Not too shabby! But in between September 1st and the 1-year bloggoversary (September 5th), we got our mid-year bonuses! Nice! So I threw in another $1,500. That put the bloggoversary balance at $75,518.30, a decrease of $1,467.40 with $32.60 in interest in those 4 days. That brought the total paid off in the year since the blog launched to $19,508.57 and 20.53%! Just shy of of $20k, and over one-fifth of the debt paid off. Wow. Despite feeling like I’m still a debt-paying slacker half the time, I can honestly look at these numbers and be impressed with myself. $19.5k is no joke! Now, I could’ve thrown a ton more towards the loans with the bonus money, but instead put it in places it’s been needed: we officially opened up a joint weddings savings account and I put a big chunk toward my emergency fund (reserved for much-needed car maintenance). Also paid for the plane tickets back to California as my brother just had his first baby! My first nephew! Sometimes just throwing a ton of cash at the student loans makes it seem like it’s going into a black hole…so this way I feel like I’ve distributed it evenly into various debts and savings/emergency funds. Overall, I feel like I’m in a pretty good place. I haven’t been as stressed out about finances lately as I’ve learned to control what I can, and that most of the pressure comes from within. Changing up the game plan last month really helped, along with communicating better with Mr. Bacon about our joint budgets. It still seems like so much to go, but then again, looking at $75k is mind-blowing when I remember how many years (over the last 5!) I had “about $95k of student loans” that never seemed to budge. The newer game plan has me on target to be under $70k by New Year’s Day 2015, and under $50k by the 2-year bloggoversary, which will be the month of our wedding. YAY! Let’s keep the momentum going strong! 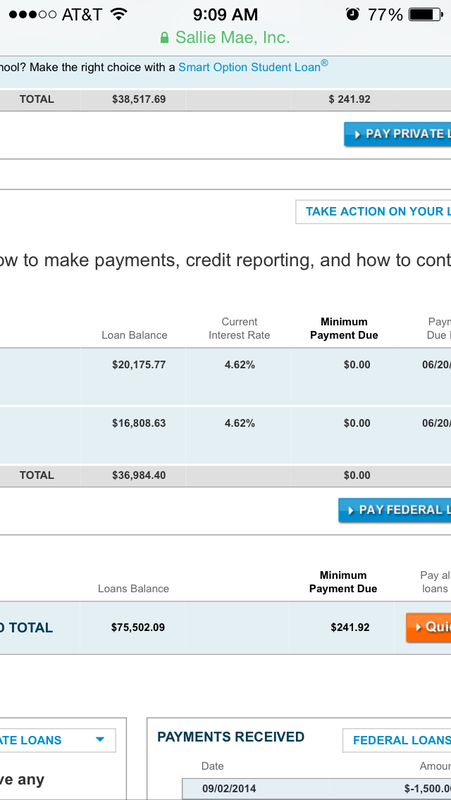 $8.29 in interest per day…small victories! In doing my monthly calculations, I’ve realized that the amount I pay in interest has slowly but surely come down. Sallie Mae’s interest compounds daily (ugh), and I tracked the last few days to see that it’s been $8.29 per day of interest since my last extra payment. Which makes for about $240 to $250 per month in interest, which is a bit less than the $300-ish a month when I first started the blog. At this point, I’ve paid down about 19% of the original amount, woohoo! That’s almost one-fifth! So it makes sense that my interest has gone down about one-fifth as well. I still have a ways to go but it is nice to see that the numbers are slowly budging. Even if it does seem soooooo slooooooow! Anyone else calculate how much interest they are racking up each day? It’s eye opening! It’s like an entire meal! Game Changer…changing the game plan! I’ve made a concerted decision to update my game plan and move my self-imposed deadline from my 35th birthday (November 2016) to a bit later…May 2017. Not that you were even aware that I’ve kept changing my self-imposed deadline. When I originally started the blog, I was really conservative (and realistic!!) and said I wanted it all paid off by my 36th birthday (November 2017). Then I started making some more aggressive to “SUPER AGGRO” plans and kept turning it up from Labor Day 2017 (aka the blog’s 4th birthday), up to Labor Day 2016 (the blog’s 3rd birthday) or our first wedding anniversary (both September 2016). So it’s gone anywhere from a 4-year plan to a 3-year plan in trying to pay off $95k in debt, which would be a decrease of $25k to $35k per year (not including interest!). Then reality set in, and I recently pushed the deadline back to my 35th birthday when I started to realize I couldn’t keep up with those aggressive payments. In fact, I don’t think I’ve even nailed any of the monthly goals for any of the aggressive plans, and then I end up just being extremely hard on myself and feel like I never have enough money. No wonder I get really stressed out and depressed over feeling like I’ll be poor and paying off my student loan debts forever! So over this weekend, I finally thought “ENOUGH!” What’s another 6 months of paying off student loans if it means that the next 2 years will be that much less stressful? I was finding I didn’t have any extra money to contribute to an emergency fund (for car repairs), the travel fund, the triathlon fund, or the wedding fund. (And no…definitely not any retirement funds.) I’ve been waiting for the mid-year bonus (any day now, please!) to take my car in, as it hit 90k miles recently and is overdue for a check-up and probably new brakes. My savings/emergency fund is practically nonexistent. We don’t have the minimum $500 to open up a savings account for the wedding. And I charged our airline tickets to CA next month on the new United credit card (balance not due until October). I can’t live that way. It’s ridiculous. Since making the decision (in my head) to go a little bit easier, I’ve felt a wave of relief. That’s the obviously nice thing about self-imposed deadlines. They are SELF-imposed! Duh! That means you can change them…yourSELF! I’m already feeling way better and less stressed. The next few months I know I’ll be able to make these payments and won’t beat myself up so hard. Anyone else find they try to bite off more than they can chew?